SULTAN! For me it’s the first film of 2016 for which I m damn excited. All the best! A release almost every week. A packed year. Only khan films look to have 3 weeks open weeks. Even hrithik akshay clash will have only 13 open days. Shivaay will have good period also if ajay can get majority screens in clash. So fasten your seatbelt and expect a big and hopefully a successful year for bollywood. And Indicine how come sonakshi sinha is in mohenjodaro? Kindly correct. I can’t wait for 15th April.Just read the synopsis of the movie and it looks so refreshing and different. Srk has already said by the end of his career he should be able to show any 5 of his movies to his kids and fan is one among those. Raees looks equally exciting with srk back to his forte of playing character with grey shades.There’s no actor who could portray such roles with the conviction and ease with which srk does.Both darr and baazigar are landmark movies when it comes to performance. I think many clash will be adverted after Dilwale vs BM showed everyone that both lost money from the clash and that the outsider can win. It would be better for the industry if clash such as Rustom vs Mohenjo Daro or Raees vs Sultan are adverted. They make no sense ! Kriti Sanon in Sultan ??? Sonakshi Sinha in Mohenjo Daro? Has to be a typo. I’ve a feeling FAN will be the first major hit 2016. All other movies don’t have the potential to be hit except AIRLIFT. But since its clashing with KKHH3 can’t say anything. Kriti sanon in SULTAN. are you sure team indicine? Year of clashes! All 3 of Akshay movies are clashing with another movies. I don’t think it’s a good strategy. FAN & RAEES are gonna bring back the actor SRK !! This is surely year of clashes. So many small n big clashes this year. 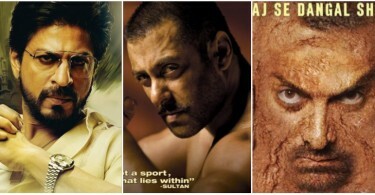 This year list of blockbusters might be less bcoz of clash factor. So dangal is clashing with bahubali 2? If dangal is a good movie people will watch it no matter how big is bahubali. FAN & RAEES are gonna bring back the actor SRK !! Currently he is a superstar SRK, but the actor side of his is not exploited much now-a-days !! Surely gauri shinde’s movie will release in mid November. Anyway not excited for it as srk has only a small role in it. @Arjun Stop your stupid and baseless prediction.Just because bm did well doesn’t change the fact that you were the same person who expected BV and tevar to cross 100 crores.